General Dwight David Eisenhower became chief of staff of the United States Army, commander of NATO, and the thirty-fourth president of the United States. As a military leader he led the Allied troops in the European Theater to victory during World War II. As president from 1953-1961, his principal achievement was the maintenance of world peace during the crisis-filled 1950s. His domestic policy record is mixed. While an expanding economy made the postwar era a prosperous one for many Americans, Eisenhower's failures to act decisively against Senator Joseph McCarthy's anti-communist investigations and his lackluster commitment to civil rights scarred his policy legacy. Born in Denison, Texas, Eisenhower spent his childhood in Abilene, Kansas. After graduating from West Point in 1915, he embarked on a military career that initially promised nothing more than backwater assignments and slow promotion. 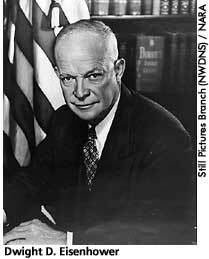 Nevertheless, Eisenhower was an excellent manager and a committed officer who was highly regarded by his superiors. These talents paid off during World War II. Eisenhower rose rapidly to become supreme commander of the Allied Expeditionary Force. As such, he planned and led the Allies' June 6, 1944, invasion of France (D-Day) and their subsequent victory over the Germans a year later. When the war ended in 1945, Eisenhower served as head of the occupation forces in the American zone of a partitioned Germany before returning home to become chief of staff of the U.S. Army. He left the army in 1948 and became president of Columbia University in New York City. Eisenhower's military success and popularity at home made him a logical presidential candidate. Believing that military professionals should not be involved in politics, Eisenhower resisted overtures from both Republicans and Democrats that he run for president in 1948. Instead he went back into the military as the first supreme commander of Allied forces in Europe where he helped organize the beginnings of a NATO force and urged the creation of a United States of Europe. In 1952 he reversed his earlier decision and entered politics as the Republican candidate for president. He won handily in that election and in 1956, each time defeating Democratic candidate Adlai Stevenson by a substantial margin. As president, Eisenhower followed a policy of social and economic "dynamic conservatism." He trimmed the defense budget following the Korean War but approved an increase in Social Security. His administration was also responsible for the interstate highway system, one of the largest public works projects in American history. At the same time, Eisenhower worked to avoid the use of nuclear weapons and he cautioned the country against what he termed "the military-industrial complex," which he thought was aiding and abetting the arms race between the U.S. and the Soviet Union. As Eisenhower rose in his countrymen's estimation, his standing with Eleanor Roosevelt sank, and she worked assiduously to defeat him in 1952 and 1956. At the outset of his political career, she thought he was long on glamour and short on political conviction, particularly when he failed to defend General George Marshall, the man most responsible for his rapid promotion during World War II, against charges of communism. She also thought his choice of Richard Nixon (who had played on his California constituents' fear of communism to defeat her friend Helen Gahagan Douglas for the Senate in 1948) was particularly irresponsible–especially after Eisenhower suffered a massive heart attack in 1955. Later she felt Eisenhower catered too much to public opinion in his handling of Senator Joseph McCarthy's allegations of communism in the federal government. She also deplored his administration's poor record on civil rights, especially his reluctance to implement the Supreme Court's directive to end school segregation in the aftermath of the Brown v. Board of Education ruling in 1954. She was particularly incensed over his initial failure to send federal troops to Little Rock, Arkansas, in 1957 to protect black students attempting to integrate the high school there. For his part, Eisenhower liked neither ER's politics nor her style. In the wake of his 1952 election, he accepted her resignation from the U.S. delegation to the United Nations with only a perfunctory letter of thanks, despite her significant contributions to the organization's success. He also barred her from White House social events because of remarks she had purportedly made about his wife, Mamie. The two were never reconciled although Eisenhower did attend ER's funeral in 1962. After serving two terms as president, Eisenhower retired to his farm in Gettysburg, Pennsylvania, where he wrote his memoirs, played golf and painted. He lived to see Richard Nixon elected president in 1968 and his grandson, David, married to Nixon's younger daughter, Julie. He died in 1969. American National Biography. New York: Oxford University Press, 1999, 374-379. Black, Allida. Casting Her Own Shadow: Eleanor Roosevelt and the Shaping of Postwar Liberalism. New York: Columbia University Press, 1996, 116, 118, 164. Concise Dictionary of American Biography. 5th ed. New York: Charles Scriber's Sons, 1997, 348-349. Lash, Joseph. Eleanor: The Years Alone. New York: W.W. Norton & Company, 1972, 213-214.